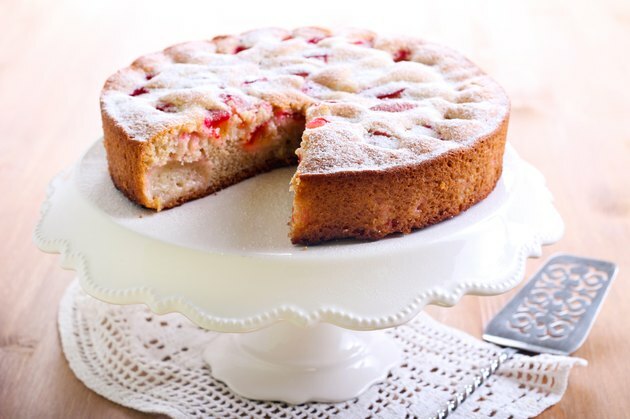 Adding preserves to a box cake mix can create a dessert that resembles a favorite homemade cake. Preserves come in many fruit flavors, offering variations to jazz up plain cake mixes. Preserves also offer a shortcut for glazing or filling a layer cake to save time when you want to create a cake that looks homemade without having to create it from scratch. Mixing preserves with cream cheese and a small amount of cake mix works well to add fruit flavor to old-fashioned-style jam cakes or coffee cakes. This method improves how the preserves bake into the cake, giving the cake bites of distinct fruit flavor instead of having the preserves blend throughout the batter and lose its impact. For example, a Tennessee jam cake and an apricot-almond coffee cake featured on "Southern Living" magazine's website call for 1/2 cup of preserves combined with cream cheese and 1 tablespoon of box cake mix. You add this mixture in dollops to the rest of the batter in the cake pan. Adding 1/2 cup of all-fruit preserves to a box cake mix adds a subtle, fruit flavor and increases the moistness of the cake. For example, add blueberry preserves to angel food cake, strawberry preserves to yellow cake or cherry preserves to chocolate cake for a rich, closer-to-homemade effect. To add the preserves, combine them with the wet ingredients, such as water and egg, and then stir the cake mix slowly into the wet ingredients to complete the cake batter. Using all-fruit preserves cuts down on the added sugar, but you can use regular preserves if you prefer. Using fruit preserves as a layer-cake filling increases the fruit flavor of a the cake that has preserves baked into it. Spreading preserves on top of the bottom layer of the cake after the cake cools creates the filling. It isn't necessary to heat the preserves or add other ingredients. You can finish the cake by heating preserves and mashing them through a wire strainer or sieve with the back of a large spoon to create a glaze. Pouring the glaze over the top layer of the cake completes the fruit preserve layer cake. Replacing sour cream with low-fat sour cream or yogurt in coffee cake recipes cuts down on calories and fat. Pineapple preserves and grated carrot mixed with a spice cake mix creates a moist and sweet carrot cake. Substitute low-fat cream cheese for the cream cheese icing for a version that satisfies the desire for a creamy topping with less fat. Garnish the cake with fresh fruit slices, chopped nuts or edible flowers to create a colorful presentation. Nasturtiums have a mild, peppery flavor and create a ring of color around the base of the cake or work as a cake topper.